Recently released details around how the government plans to see its latest round of welfare reforms carried out, show that the Ministry of Social Development is taking a hands off approach to the implantation of its controversial changes. The most recent benefit reforms, which came into effect on the 15th of July, make a number of changes to the requirements on people receiving social welfare as well as a complete restructuring of benefit categories, which are now reduced to three benefits: Jobseeker Support, Sole Parent Support and a Supported Living Payment for people living with their own or a dependant’s disability. People receiving support will now be required to: notify Work and Income if they or their partner plan to leave the country, have their children enrolled with a preschool, school and doctor, undergo pre-employment or pre-training drug testing, clear any outstanding arrest warrants, and reapply for support every year. Where these new requirements are not met, people will lose their benefit for 13 weeks, or have this halved for the same period if they have dependent children. If someone is considered fit for work and turns down a “suitable” job, they will also face these cuts to their support. There has been much controversy over this latest round of welfare reforms throughout the process of the changes being developed and upon their announcement, some of which has been covered in previous Fightback articles. It has only been recently, however, that information has become available around some of the finer details of the legislation, particularly how private employment agencies and beneficiaries themselves will be made responsible for delivering some of the contentious requirements of the reforms. In keeping with its aim to reduce beneficiary numbers, the Ministry of Social Development has detailed plans to shift people with mental health conditions, such as depression and anxiety disorders into work. While other “jobseekers” will be supported for as long as it takes to find work by Work and Income case managers, MSD is contracting private services to work on providing wrap-around care and securing employment for people experiencing mild to more intense mental health issues. 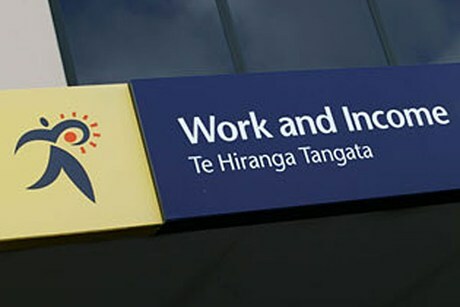 The payment of set sums of money to these yet to be announced agencies when clients gain employment is concerning, as is the six month time limit for achieving employment before the individual is exited from the service and is no longer eligible for intensive, wrap-around support in their search for work. Not only does this approach incentivise moving as many people as quickly as possible into jobs, but it shifts the focus away from wellbeing, which may well be compromised as people enter jobs in an employment environment of low wages, high competition and reduced rights and protections. Another concern we should have is that, through the process of contracting out this potentially harmful ‘service’, people who experience mental health issues and the pressure to find employment first-hand, their friends, family and community, and opponents of the compulsory intensive support programme will direct their indignation toward those agencies providing employment services. It is important that our opposition to this new intensive support initiative is directed at the State, rather than the agencies who, within the context of a volatile funding environment, have chosen to take on these contracts. Also important is retaining an analysis of how the practise of pushing people who are amongst the least able to work into employment, without addressing the employment conditions that lead to their exclusion from the labour force, strengthens hegemonic ideas around disability and ability to work as well as directly benefiting the capitalist class. A further aspect of the benefit changes that has recently come to light, sparking criticism, has been related to new requirements of beneficiaries to undergo drug testing before entering work or training. Previous concerns with this requirement focussed on the amount of public money that would be wasted on mass drug-testing that would yield few positive results, and thus would require far greater expenditure than the savings made by cutting benefits of those who tested positive. Work and Income will “provide them [beneficiaries] with a list of testing agencies in their area and the cost that the testing agency charges for a test, confirm with the beneficiary which testing agency they choose, [and] offer assistance to the beneficiary to help meet the amount of taking the test and explain that this must be repaid from their benefit”. 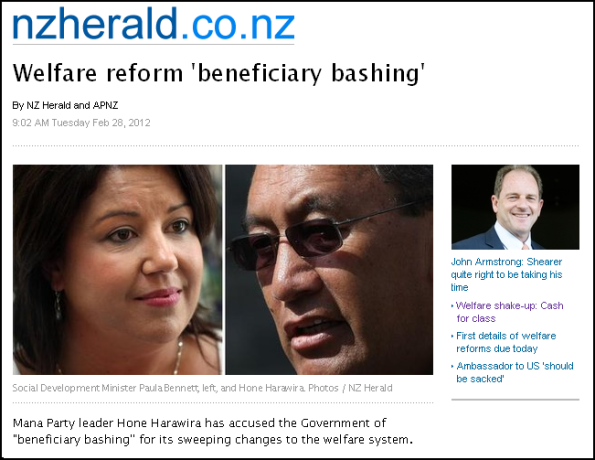 This is a far different process from that originally outlined by the minister which would see the cost of drug tests falling on potential employers, with the cost only being reimbursed by WINZ and recovered from the person’s benefit if they returned a positive test, and will obviously have a much greater negative impact on people’s already tight finances and rightful sense of persecution. In considering these changes, along with wider context of benefit restructuring and cuts, it is important to recognise the state as the institution pushing punitive and detrimental management of people in need of support, no matter how it tries to become invisible by delegating out its most contentious work. Opposition to welfare reform needs to recognise that the oppressive and stigmatising treatment of people in need of support is tied in with the economic objective of welfare cuts – it is a purposeful, ideological aspect of the overall assault on working-class organisation and solidarity. In challenging these changes, we need to be demanding both jobs for unemployed job-seekers, and for the right of people not performing paid work to receive adequate financial support in a way that respects their wellbeing and dignity.